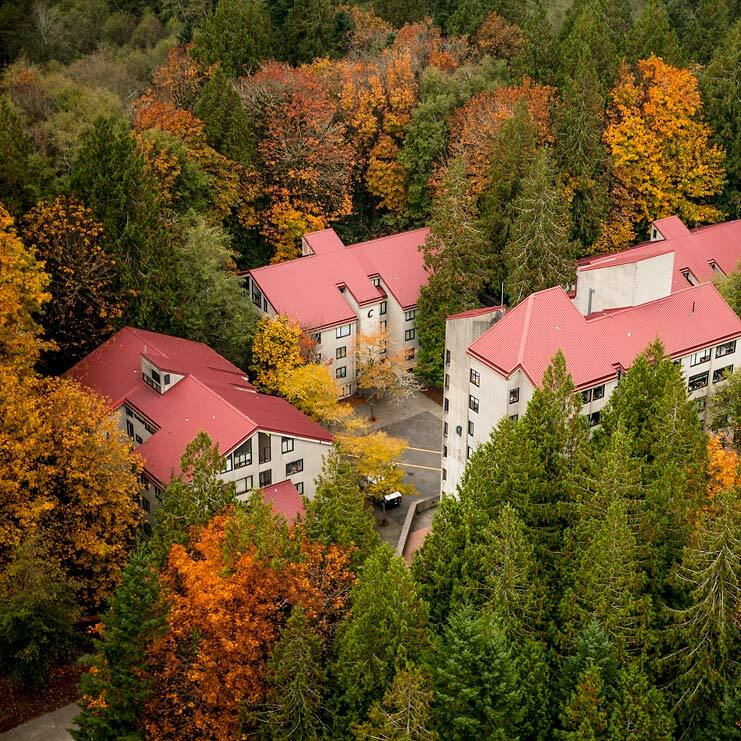 The following Student Housing Contract (Contract) is hereby entered into between The Evergreen State College (College) and a student attending the College (Resident). This Contract covers all Residential and Dining Services areas and specifically the Unit (bedroom, or apartment/suite) a Resident is assigned to and the building and common spaces in which the Unit is located. The Resident agrees to abide by all State of Washington laws; Thurston County laws, ordinances and regulations; and to be bound to the terms and conditions of all College regulations and policies, as they exist now or may later be amended, including but not limited to the Student Conduct Code, and Residential and Dining Services Policy. The College is exempt under RCW 59.18.040 from complying with the requirements of Washington’s Landlord Tenant Act. Residents must be enrolled students of the College. Residents will be at least 17 years of age at the time of check in. Residents who have been convicted, pled guilty or pled no contest to a crime other than a minor traffic violation must disclose details and provide information as requested in the housing application process. The Evergreen State College will review the circumstances of the crime and determine whether the student’s application to live in on-campus facilities will be accepted. Any incomplete, inaccurate, or false statements or misrepresentations by an applicant in the Housing Application or Student Housing Contract may lead to denial of housing and may be considered a breach of Contract and a basis for termination of the Contract. ​Start: Friday, September 21, 2018 at 9 a.m.
End: All Housing - Wednesday, June 12, 2019 at 5:00 p.m.
Start: Saturday, January 5, 2019 at 10 a.m.
Start: Saturday, March 30, 2019 at 10 a.m. Residents of buildings A, B, and C must vacate their Unit for winter break closure from 4 p.m. Friday, December 14, 2018; to 10 a.m. Saturday, January 5, 2019. For winter break housing, please fill out the Winter Break Housing Request Form . We have a limited number of spaces that will be assigned on a first come, first serve basis. Residents who are graduating or have an approved academic purpose in June may request permission by May 31, 2019 to stay past residential closing at 5:00 p.m. on Wednesday, June 12, 2019. All Residents who have 40 or fewer credits at the time they move onto campus are required to purchase a meal plan for the entire academic year. Residents are responsible for understanding and adhering to the Meal Plan Contract. All applicants reserving a Unit are required to pay (or if eligible, defer their payment of) a Housing Down Payment and Booking Fee in order to secure a room assignment. The Down Payment is applied toward the Resident’s first quarter rent. Housing Down Payments and Booking Fees are non-refundable. Exceptions to this non-refund policy will only be made for documented medical reasons approved by the Assistant Director for Residential Life or their designee. Prior to occupying a Unit, an applicant may cancel this Contract by e-mail, in person, or by phone, by providing notice of the intent to cancel to the Assistant Director for Residential Life or their designee. The date of notification will be the official date of cancellation. The Contract shall be deemed automatically canceled if an applicant fails to check in and receive keys for a Unit within 3 days of the beginning of the Contract term, or if the Contract is entered into after the start of a quarter, within 3 days of the Unit reservation being secured with the Housing Down Payment by the applicant. As provided for herein, the College will retain the Down Payment made by the applicant in the event of such cancelation. A Resident who moves out without an approved "Release from Contract” form and/or is evicted by Residential and Dining Services will be considered to have broken the Contract. A Resident with a broken Contract is obligated to pay the full rental rate for the current quarter plus a fee for not honoring the remainder of your contract: $700 if broken in fall quarter, and $350 if broken in winter quarter. Residents must check out when they vacate their Unit and return any keys, and can do so by following the process outlined online or by contacting the RAD front office. Residents must check out before 12:00 noon on the Friday of Evaluation week of Fall and Winter Quarters to avoid being charged for the full cost of the following quarter, as well as additional charges and/or penalties. Spring quarter check out must occur before Wednesday, June 12, 2019 at 5:00 pm. If a Resident does not check out properly by following the check-out process, they will be charged an improper check out fee of $100. In the spring quarter, failure to check out by the end of the Contract will result in a $300 late checkout fee plus the $100 improper check out fee. Academic Internship, Study Abroad, or an Individual Learning Contract which requires the resident to live outside Thurston County for a period of 30 consecutive days or more during an academic quarter. Change of academic status with the College such as Academic Leave of Absence, Academic Withdrawal or Graduation. Medical Release. Access Services will need to collect medical information and possibly consult with your health care provider explaining why the medical condition requires the Resident to be released from their housing contract. Residential and Dining Services requires thirty (30) days from receipt of notification from Access Services to work to accommodate the Resident’s specific medical needs before considering the Contract Release. If a Contract Release is approved, the Resident will be billed for the number of days the Unit was occupied prior to check out, with the following limitations: If the Resident checks out within 30 days of the end of the academic quarter, they are obligated to pay rent for the entire quarter. If the Resident checks out after 12:00 noon on the last day of a quarter and before the 30th day of the following quarter, they will be charged a $300 late checkout fee, in addition to the per diem cost of their Unit. Residential and Dining Services reserves the right to reassign any Resident to another Unit at any time in order to make the most efficient and effective use of the residential facilities. Residential and Dining Services may also consolidate a Unit(s) when the Unit is 50% or less occupied, at Residential and Dining Services' discretion. Residential and Dining Services reserves the right to reassign any Resident to another Unit at any time in the event such a reassignment is deemed necessary and is reasonable under the circumstances. This includes, but is not limited to, the welfare of residents; violations of Housing Policy or the Student Code of Conduct; to accommodate facilities operations or repair; and to accommodate students with disabilities. If a roommate leaves, the remaining Resident must be willing to accept a new roommate when someone is assigned to the vacant space at any time during the academic year. If a Resident refuses, or does not maintain the Unit in such a way that a new roommate can move in, the Resident may be charged for use of the additional space. At Residential and Dining Services' discretion, a Resident may be given the option of reduced occupancy, allowing the Resident to pay an additional charge to use a shared Unit as a single. The Resident’s Contract may be terminated by the College upon any of the conditions set forth below. Termination of the Contract by the College will be treated as a “Contract Break” unless the College grants a “Contract Release.” Termination of the Contract shall not relieve the Resident of their liabilities and obligations under this Contract including charges for the Unit and meal plan, Contract breakage fees or obligations, and any other charges incurred before or after termination. By Termination of Student Status: Students must check out and vacate their Unit within 72 hours (3 days) of the termination of their registered student status or being issued zero credits by their program or course faculty before the end of an academic term. Receives a conduct hold on their student registration or is no longer eligible to reside in student housing based on a final decision rendered under the Student Conduct Code. Charges for Units will be assessed based on the Resident's assigned Unit and Contract length. Residents who are allowed to move in prior to their Contract start date will be billed at a prorated daily rate for the additional days of occupancy. Adjustment in billing will not be made for Residents who move in after the beginning of their Contract; however Residents who receive a Unit assignment after the standard check in date will only be responsible for rent from the date of their assignment. Rent is billed quarterly and due in full at the same time quarterly tuition is due. Rent is paid online or at the Cashier’s Office. Rent being paid with grants, loans, scholarships or other financial aid and/or earnings from the College, is due upon receipt of the aforementioned money. If unable to pay rent in full, the Resident must contact the Residential and Dining Services Office prior to the due date to make arrangements to meet the financial obligations. A late fee of $50 is assessed for all Residential and Dining Services rent charges that are past due on the tenth (10th) day of the quarter; Residents who are waiting for financial aid to arrive may set up a payment plan in advance of the tenth (10th) day of the quarter. An additional late fee of $75 will be assessed for all Residential and Dining Services rent charges that are past due on the thirtieth (30th) day of the quarter. Residents awaiting the receipt of financial aid or College earnings and who are unable to timely pay rent will be subject to the late fee set forth herein. Residents who have not met the deadline by paying their rent in full, setting up a payment plan, or communicating with Residential and Dining Services in advance about their plan to pay, may be subject to the loss of certain housing-related services or privileges, and/or eviction. View housing rates. The Evergreen State College Board of Trustees annually approves rates in late spring. The Resident agrees to pay the reasonable cost and expenses of collection, including the collection agency fee and reasonable attorney's fees, in the event the College is required to place any outstanding account, debt or claim with a collection agency and/or utilize the assistance of legal counsel to collect on the account, debt or claim arising from this agreement. In addition, the Resident's transcript and records will be held until the debt is resolved. All Units are furnished and include utilities (water, heat, electricity, garbage) and Internet access. The College shall have the right to temporarily interrupt such utilities (due to accidents, emergencies, repairs, alterations or improvements) which in the judgment of the College are necessary or desirable. Interruption of these services may also occur due to conditions beyond the College’s control. The Resident shall claim no diminution or abatement of rent or other compensation, nor shall this agreement or any part of the obligation to the Resident hereunder be affected or reduced by such interruption or curtailment of these services. The Resident must keep their assigned Unit clean and advise Residential and Dining Services staff of any necessary repairs. The Resident is responsible for the costs and expenses resulting from damage to a Unit, or building, including college equipment or furniture, by the Resident or their guests. The Resident is also responsible for the cost of additional cleaning required to return their Unit to its pre-occupancy state. The Resident will be sent a Room Inventory form in the first five business days after check-in which allows the Resident to document the existing condition of the Unit; the Room Inventory must be turned in within seven business days of its receipt. Any alterations, modification or additions to the Unit are prohibited. Additional locks, structural additions of any kind, removal of fixtures, or painting are prohibited. All repairs, including painting, must be completed by Residential and Dining Services staff. The Resident is responsible for any keys signed out. Keys may not be duplicated or altered. A lock change is required for lost keys, and costs $75 per lock; lock changes on mailboxes cost $20. Residential and Dining Services financial charges may be appealed by filing a Financial Appeal Application; appeal deadlines may be found here as well. Appeals are reviewed by the Director of Residential and Dining Services. The College assumes no responsibility for loss or damage to any Resident's personal property from any cause. Residential and Dining Services strongly recommends students obtain insurance coverage by purchasing a renter's insurance policy or verify that coverage is available under their family's homeowner's insurance policy.